"I really haven't seen it as one of those historic, traditional Notre Dame rivalries," Kelly said during a conference call. "I've seen it as just one of those great football games that Notre Dame has played. "I've been in Michigan a long time, so I've always felt the Notre Dame-Michigan game was a big regional game. But in the Notre Dame history books, this game has (been) played, but obviously there's been some years where it hasn't been played for number of years as well. From my perspective … these have been really hard-fought, high-profile games." The media frenzy that ensued is proof that Kelly might need to reexamine his idea of what a big rivalry is. Obviously, he was forced to do that yesterday, and backtracked on his initial statement. "This is a great and historic rivalry that we'll be playing this Saturday," Kelly said during his weekly news conference. "So let's get that out of the way right away, so we don't have to answer any more questions about this rivalry. We're excited about the game, we're excited about playing it. First of all, kudos I guess to Kelly for addressing it and getting it out of the way. If you're trying to diffuse a situation, this is how you do it. Water under the bridge for the most part, but the damage is done. Second, its been my experience that Michigan fans truly enjoy the rivalry with Notre Dame, and vice versa. As rivalries with Michigan State and Ohio State are often clouded by hatred and bitterness, the Notre Dame rivalry has always seemed to maintain a civil, dare I say, gentlemanly decorum. At least by comparison, anyway. Brian Kelly and Brady Hoke are the current stewards of this rivalry, and to hear Kelly downplay the rivalry's significance publicly is disheartening – to fans from both sides, I'm sure. I'm not saying it's always been snowflakes and sugarplums between these two schools. Don't get me wrong, the vitriol is alive and well, and has been for as long as I can remember. Bo Schembechler made his thoughts clear about the Irish when he famously said "To Hell with Notre Dame". And the Irish have snubbed their nose at Big Ten affiliation for decades. But the the two school's pasts are forever intertwined. After all, it was a group of M Men back in 1887, that actually taught the game of football to a young group of Notre Dame students. 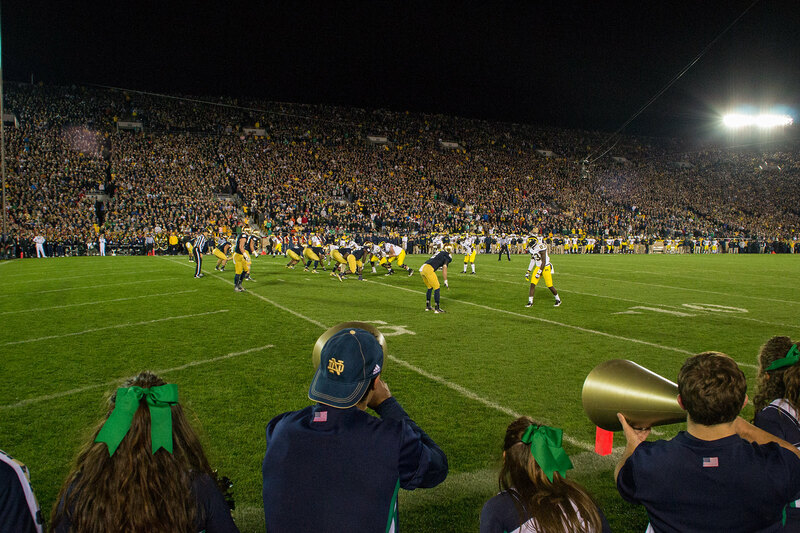 The first Michigan-Notre Dame game took place that year, and despite four separate times the rivalry has gone on hiatus, the two schools have always managed to return to the gridiron to face each other. Over the last 127 years, the two schools have played 40 times, with Michigan holding the edge in the series 23-16-1. To this day, Michigan and Notre Dame play ridiculously entertaining football games against one another. The two winningest programs in football, both trending in positive directions in recent years, are a matchup seemingly hand-crafted from football's valhalla. NBC and ABC should be meeting right now to figure out how to play this game 12 times a year. They could make it a traveling road show playing in stadiums all over the country...charging an arm and a leg, and they would still sell the thing out every time. Can anyone say Wolverine-Irish Network? All hyperbole aside, the Michigan-Notre Dame rivalry holds a special place in the hearts of the Maize & Blue faithful. And this blogger feels no different. 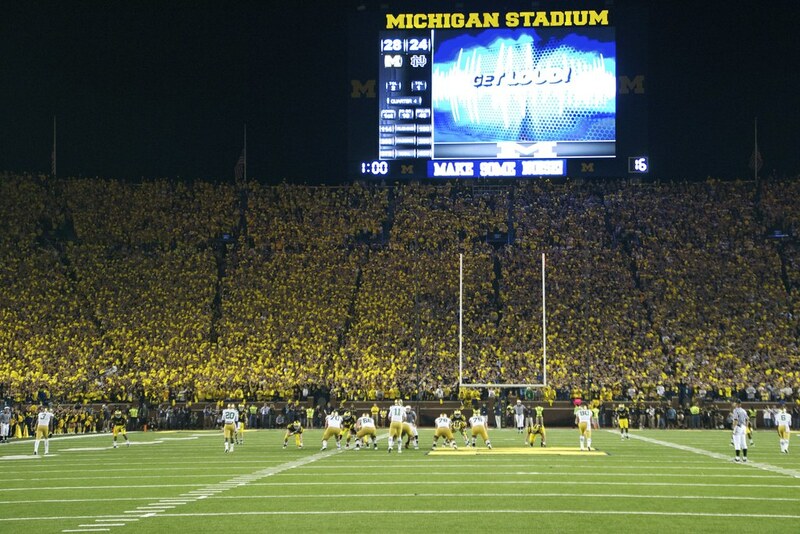 My experience covering the 2011 game, the first night home game in Michigan Football history, was an experience I'll never forget. The pregame atmosphere was unlike anything I've ever experienced inside the Big House. On the Michigan sideline during warmups, I stood in awestruck when I realized the stadium was completely full – more than an hour before kickoff! That's rarefied air for even the biggest of Michigan home games. A lot of that ambiance was due to in large part to fact that it was a night game... a new experience at Michigan Stadium. But had Michigan been playing UConn or Miami of Ohio or even a lesser B1G opponent, it wouldn't have been nearly the same feeling. When the Irish Guard and Notre Dame band marched down the field in the pregame, I have to admit, I got chills. For a brief moment, I was simply a spectator of what was going on around me...not a Michigan fan or a credentialed media member – a delicate balance which I am still trying to figure out. I was in college football heaven. The game itself was a blur for me. Up until the final few minutes which I remember in stark detail...as surely we all do. Denard to Roundtree will go down in M lore just like Wangler to Carter, Grbac to Howard, Dreisbach to Hayes and Henne to Manningham. The game resonated so much with me that I went ahead and made a highlight video. I desperately don't want the Michigan-Notre Dame rivalry to end. This Saturday night and a year from now in South Bend are going to be bittersweet for me. Because instead of celebrating the two most iconic programs in college football, we'll be focusing on the end of yet another Michigan-Notre Dame saga. 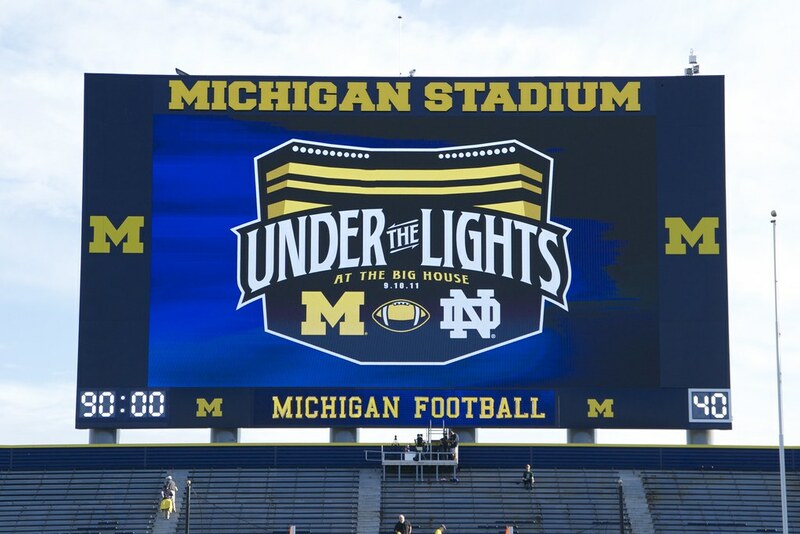 Oh sure, Michigan will play the Irish again eventually, they always do. But it may take a while. Michigan AD Dave Brandon addressed the ND topic this morning when he met with the press at the Steven Ross announcement. "No," Brandon said, when asked Wednesday morning if he planned to negotiate with Notre Dame. "Our schedule is booked going out into the early '20s, and my understanding is theirs is, as well. So my view is the only way we're going to play Notre Dame after next year would be if we run into them in a bowl game or if our schedules allowed us to have some kind of a neutral site one-off game somewhere along the way." Interesting prospect, the idea of a neutral site matchup. One that would certainly have TV networks and NFL stadium owners salivating. But I have to think that for something like that to happen, it will need to be a 3rd party (i.e. a TV network) to get the ball rolling. After Brandon was informed rather abruptly last year that Notre Dame was going to suspend the series after 2014, I don't think he's in any hurry to reach out to his counterparts in South Bend. Besides, I think #1000SSS is much more interested in marquee matchups in their stadium rather than a neutral site. So for fans of the Michigan-Notre Dame rivalry, these next two years may be all we get for a while.